Ergot Outbreak (994 C.E.) The ergot fungus, when consumed, causes Gangrene. Over 40,000 people died from Gangrene when they consumed wheat and rye contaminated with it, in the Aquitaine region of France. Also known as St. Anthony's Fire. The first documented epidemic of ergotism likely occurred in 944-945 AD, when some 20,000 people of the Aquitaine region of France died of the effects of ergot poisoning. Ergot is the common name of a fungus in the genus Claviceps and is parasitic on certain grains and grasses. 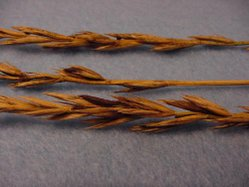 An ergot infection of a plant causes a decreased yield to the plant but has disastrous effects on humans who consume such grains or grasses. Ergot contains alkaloids of the ergoline group, which have a wide range of activities including effects on circulation and neurotransmission. The ergot alkaloids can lead to such diseases as Gangrene through the loss of blood to the limbs or even to insanity because of a loss of blood to the brain. Research by Linnda Caporael (1976) suggests that many of the people whose accusations resulted in the 1692 Salem witch trials in Massachusetts were genuinely suffering hallucinations and other symptoms of convulsive ergotism.